Alongside profit margins and market share, productivity is one of the most important factors governing a company’s performance. 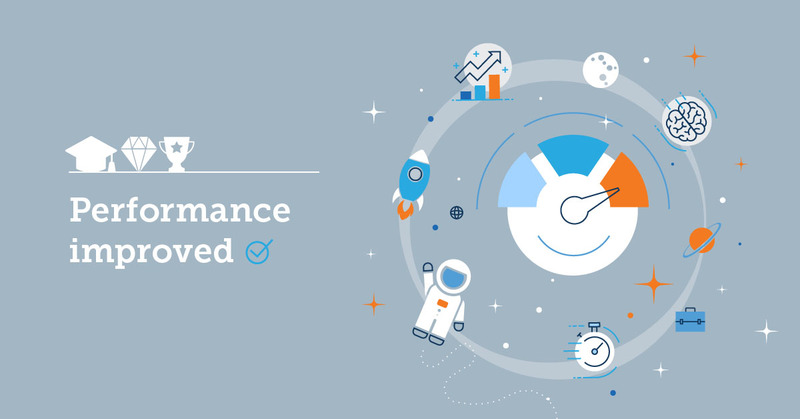 These five tips will help you build your performance improvement plan and take your employees’ performance to the next level. Improving employee performance has always been a major concern of managers and corporate trainers ― and for a good reason. Along with leadership, execution, and marketing, productivity is a key factor for business growth. Unfortunately, not all 20th-century productivity recipes have aged well. Which is why we put together this list of 5 surefire actions you can take to improve employee performance at your 21st-century workspace. 1. Measure all the things! 1) Measure all the things! Before you start looking for ways to improve work performance, you should begin with measuring your current productivity levels. Now say your business is more abstract. Like, hospitality, healthcare, construction, or aviation. This type of business needs to determine and track metrics relevant to its operation (e.g., customers served). In business jargon, these are called types of performance metrics, KPIs or key performance indicators. You’ll need to define the ones that best apply to your type of business. These suggestions might sound basic to larger enterprises because your operations are usually monitored closely. But, many small and medium businesses have poor productivity monitoring practices in place (and, often, none at all). After determining the best way to track your productivity, you should set systems in place to do this automatically, as opposed to a one-off managerial effort. For even better insight, you could break down productivity measurements across as many different aspects of your businesses as you can (e.g., by product, market, office, department, and even per individual employee if possible). To make sense of all this information, invest in a business intelligence platform. It will store, query, and compare historical productivity data for you. Use the insight you’ve gained this way (plus our tips) to come up with your employee performance improvement plan. The workflows that once worked well for your business might be dragging you down today. Perhaps the equipment that you use is now obsolete, and you must invest in some newer technology to keep up with competitors. Or maybe a production technique that you use has been superseded by a more efficient one which you need to adopt. In any case, your workflows as not set in stone. As part of your performance improvement program, you should keep a close watch on the developments in your industry, check what your competitors are doing, and frequently reassess your workflows and business processes. You don’t have to risk it all by adopting unproven new workflows wholesale. Instead, apply them partially (e.g., only at a subset of your facilities, or just to a small production run), and compare their results with those of your existing practices. Often, the best way to optimize workspace productivity is to outsource part of your work to specialized third parties. Outsourcing gives you more options (compared to being constrained to using in-company resources) and helps reduce your operating costs and streamline your operations. The idea is to keep the tasks that are essential for your business under your control while outsourcing anything that’s secondary to your core competencies. A publishing house, for example, needs editors, proofreaders, typesetters, designers, and marketing executives to operate. The actual printing, though, it can offload to a book printing service. This way it avoids the equipment, office space, maintenance, and administrative costs associated with running its own press. Outsourcing lets you pick the best, fastest, or cheapest provider of a particular service, and this enables you to respond faster to business peaks and changing market conditions. The outsourcing of non-essential workflows works well for reducing administrative overhead. It allows you to increase productivity by focusing your resources where it matters: in the areas that differentiate you from the competition. If you want to know what prevents your workforce from being more productive, why not directly ask them? Your employees will be intimately familiar with any long-standing problems in the company’s workflows, and some of them will even have suggestions on how to fix them. Now, depending on your company’s size and culture it might be best to conduct such a survey anonymously. This will make it easier for employees to speak up and tell potentially unpleasant truths while avoiding nasty office politics. You can be old-school and set up a ballot box for employees to drop in their suggestions, or use an online platform that can handle polls and surveys. The latter will be far more convenient but might cause some employees concerns about their opinions being tracked back to them. That said, if you take pride on your transparent corporate culture or run a small tightly knit business where everybody knows each other’s opinion anyway, then feel free to conduct your survey in the open too. The next step is to analyze the responses that you’ve gathered, and act on them. Look for multiple complaints calling attention to the shame shared pain points. Those will usually be the issues having the most impact on improving work performance. One-off complaints from employees with a unique perspective can often identify serious problems that everybody else has missed ― so read everything carefully. When it comes to addressing things, prioritize issues that affect the most employees, and start from the low hanging fruits ― problems that can be easily fixed to improve work performance with minimal disruption and cost. Developing your employees’ skills is one of the best investments you can make as part of your performance improvement process. Fortunately, setting up an employee training program is not as complicated or as expensive as it used to be. A modern LMS like TalentLMS comes with all the tools a business needs to build, deploy, and manage its employee training courses. What’s more, with a Cloud-based eLearning platform you don’t even need your own servers and administrators. A simple online account is all it takes to get going. It’s still up to you, of course, to come up with an employee training curriculum that fits your corporate roadmap. To come up with the right training plan to improve work performance, you’ll need to take a good look at your current needs and your future goals and determine the skills that will carry you forward. This process should involve discussions with C-level executives and team leaders from different departments of your company. Don’t take self-reported employee skills for granted. Use the Tests, Quizzes, Surveys, and Reporting facilities in your LMS to determine your employees’ skills and knowledge levels. Add ancillary courses to help employees catch up with the prerequisite skills that they lack. Boost workplace productivity even more by going beyond technical training. Teach your employees soft skills. Choose from the many professional courses on topics such as leadership, time management, project planning, prioritizing and so on, or create your own. Finally, try to foster a learning culture in your workplace. A company-wide subscription to a corporate eLearning library, for example, will give employees the ability to choose their preferred learning paths and study on their own. Throw in some motivational rewards (special bonuses, career advancement opportunities, etc. ), and you’ll have employees competing to develop their skills. These five tips are great starting points in your journey to improve work performance and increase employee productivity. Have you tried these suggestions? Leave us a comment if you have some tips of your own that you’d like to share with other eLearning professionals.